Pictured standing left to right: BTVI Professional Development Courses Coordinator, Paulette Davis-Richardson; Costume Institute of the African Diaspora (CIAD) Projects and Events Manager, Paula Allen and Bahamas Technical and Vocational Institute (BTVI) Associate Vice President of Fund Development, Alicia Thompson. 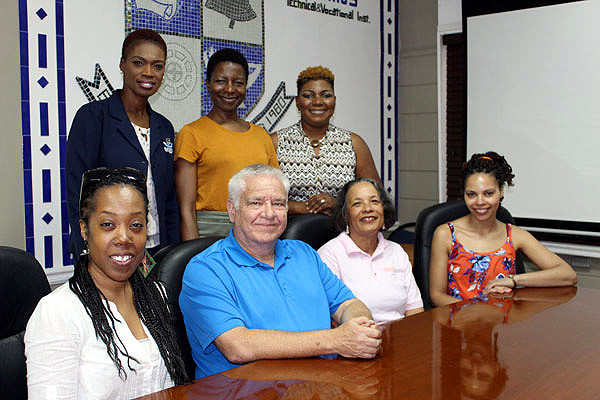 Sitting left to right: CIAD Creative Director, Teleica Kirkland; BTVI President, Dr. Robert W. Robertson; Creative Nassau President, Pamela Burnside and CIAD Research Development Officer, Stacey Balfe. Representatives from the Costume Institute of the African Diaspora (CIAD) – located in the United Kingdom – recently paid a courtesy call on President of The Bahamas Technical and Vocational Institute (BTVI), Dr. Robert W. Robertson, for preliminary discussions regarding a possible partnership aligned with BTVI’s Fashion program. CIAD is associated with the Straw Artisans of The Bahamas. Representing Creative Nassau was President, Pamela Burnside.